It could be argued that Gary Semics' career off the track is as successful as he was on the track. So how do you surpass the distinction of being the first Supercross Champion for the 500cc class? Then add a runner-up finish in the AMA 500 National Series in 1976 and a third-place grab in 1979. Don't forget all the Nationals won stateside and taking seventh-place in the 1982 500cc World Championship Grand Prix Series. Semics was racing nearly full-time at the age of 14 and at 16 he was practically unbeatable in the open expert class contests he entered in Pennsylvania, New York and Ohio. So, it's no wonder the Gary Semics MX School is rolling in on 30 years of training the best and brightest on the track today. Founded in Ohio shortly after his pro career ended in 1985, Semics' name is widely regarded in the world of training and instruction, and he began his classes long before it became vogue. His rich history of racing enabled him to switch focus and hold in-person motocross training classes where he doesn't simply teach you how to hold on. His techniques and instruction help the rider prepare better - whether it's bike mechanics or on practice days. Semics has taught and helped refine the skills of some of the best and brightest riders before they moved on to the amateur and pro ranks. Additionally, he now produces instructional DVDs for those who can't head out to Ohio, where he holds classes. Check out his website for riding tips, to watch previews of technical riding instruction, order DVDs (or stream) and learn more about his Motocross school. What dirt bike did you start on: My first real dirt bike was a 400 Husqvarna when I was 15. My first motorcycle at age 10 was a Harley 50. It was more like a moped but it actually had foot pegs instead of pedals. What are you riding now: Two KX250Fs - 2012 and 2013. I also have a RM250 2 stroke 2005 but I hardly ride it anymore. It's going to be a collector bike. 1. You've got a long distinguished career including winning the first ever Supercross Championship in the 500cc class in 1974 - what stands out as your most proudest accomplishment in racing? That's a tough question. I'd have to say my speed and conditioning in 1976. Although I fell six points short of the 500 National Title that year, I did win the last three Nationals, one of them being a very rough, hot sand track in St. Petersburg, FL where I won both Motos and they were still 40 minutes plus two laps. I also won a few Trans Am Motos that year. I was reaching my peak in 1976 and set to come back stronger in 1977 but a severe calcium deposit in my left quad, caused from a practice crash just before the start of the season, put a damper on that year. I should have pulled out for the year as I couldn't even put my left leg out for a corner. I was so gung-ho I forged on anyway finishing in the Top 10 in both Supercross and Nationals but that wasn't good enough to stay with Kawasaki for the next year. In 1978, I rode for Can Am and spent most of the year developing the bike. Another highlight is my seventh-place in the European 500 Grand Prix Series in 1982. I was 27 at the time and had the feeling that I could still win but US teams were not ringing my phone. So in February 1982 I packed my bags and went to Europe on a wing and a pray as a full on privateer. Europe was where it all began and I wanted to experience it. Not only was success a long shot but after I got there, through the rest of February and March, things really went south. The worst thing that ended up plaguing me was a deep seeded viral and bacterial infection I came down with in mid-January from over training with a head cold. I couldn't shake this illness until mid-June. I was never able to train, always being sick, I just rode as much as I needed to and rested. But through all this adversity I discovered something in myself, a willingness that would not accept failure. I just knew it was going to work out. Long story short it did workout just as I had hoped and visualized. After six months of racing in Europe I ended up 7th in the series and signed a tentative contact with Kawi to race the GPs in 1983. 2. 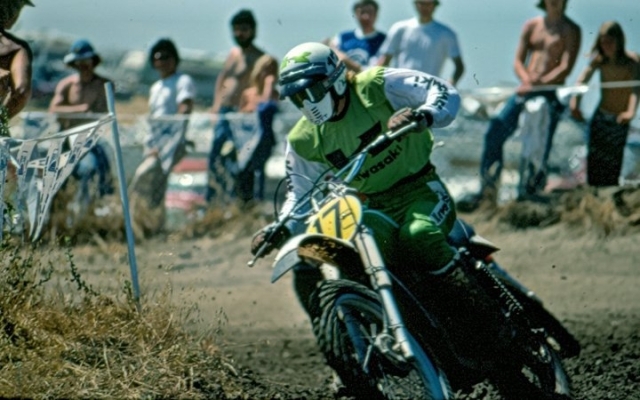 Supercross ended the 500cc class after the 1975 season did that impact your career much? No, not at all. Until that time the 500 class was the premier class in Supercross and Motocross. It continued to be the top class in Motocross until sometime in the mid-80s, I believe. In 1976 the 250 class took its place in Supercross. By that time, the development of the 250s had caught up to the open bikes and they were better for Supercross. 3. You switched to Kawasaki in 1975 after winning the championship in 1974 on Husqvarna - what was the reason for the switch and do you think it affected your second Supercross season? 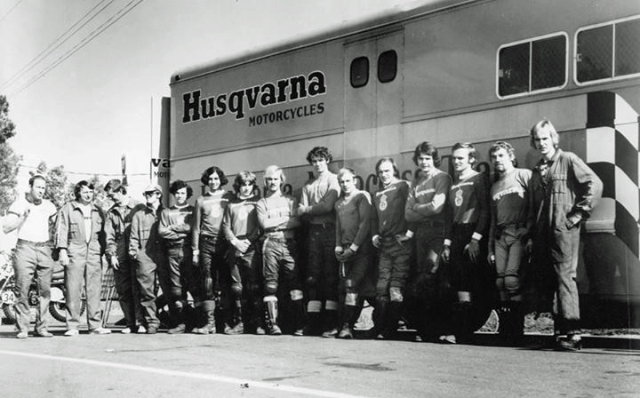 In 1974, Bob Grossi and I were the two strongest riders on the US Husqvarna Team but that didn't stop Husky from firing both of us for getting injured on mini bikes. The injuries happened one day apart causing us to miss several Trans Am races. Bob tore his ACL really badly and I broke my left elbow. When I was ready to return to the series and do the last two races in Livermore and Saddleback, CA I found out that Husky had already given my ride to Kent Howerton. I was fortunate that Ron Turner, who was the mechanic for Billy Grossi (Bob's younger brother), talked Honda into letting me race Billy's practice bike. I finished 4th and 3rd overall in the last two rounds. That was probably the deciding factor of getting hired by Kawasaki for 1975. That year in 1975 I was the only Motocross/Supercross rider for Kawi. 4. In 1985, your pro racing career came to a "forced ending" as you say. What happened? That's a long story, but to sum it up, in 1984 I was still racing in Europe. I couldn't get any good support and was spending my own money to race as a privateer. About half way through the GP Series - 250 Class this time around - we raced in Yugoslavia and the next race was in Czechoslovakia. I was literally at the crossroads trying to decide on going to Czechoslovakia or heading back to Belgium and throwing in the towel. The freeway was going to split and just before it did I told my mechanic, who was driving, "Belgium." That was it. I partied with my friends I had met in Genk, Belgium until I managed to sell all my stuff (truck, bikes and parts) then went back to CA. 5. You founded the Gary Semics MX School shortly after and now teach Motocross racing. How'd you decide to get into teaching? Doing Motocross schools was a natural fit for me. Training and racing was the only thing I really knew. I figured, why start something new, why not continue to do what I already have going. But I have to say there was a little sidetracking going on. I started going to acting school and worked in the industry for about two years on the Universal Studios Live Action Show as a stunt man and actor. It was a great job for me because we all worked a split shift which was four days on then three days off, then three days on and four days off. The pay was fantastic and I still had time to go to acting school, do some Motocross schools and ride. Even my part in the Universal Studios Show was on a KX250. After two years I realized to be a successful actor you have to love acting and I didn't. I loved motocross. So it was back to training, practicing, racing and doing schools fulltime. As I started doing more and more schools I began to realize in order to make a decent living there was a whole lot of work to do. After some more time I realized I didn't want to keep traveling in order to do enough schools. That's when I produced my first Motocross Technique DVD with the help of a Pro Videographer named Ed Lazor who also had a love for Motocross. 6. Cleary you were ahead of your time in the art of teaching Motocross training and instruction. Did you know this was a missing element in the sport or were you simply interested in helping kids and staying in the game, so to speak? I really didn't know how big Motocross schools would become. I was just doing what I wanted to do. I still loved riding and helping riders learn the right way instead of going through the School of Hard Knocks like I did. I'm very grateful that it worked out so well. I'm also very grateful to all the companies who have supported me through the years like Alpinestars, Dunlop, Works Connection, Wiseco, Fox, Scott, Factory Connection, Maxima, Renthal and VP Racing Fuels. 7. You've helped train Jeremy McGrath, Kevin Windham and Ryan Villopoto. Can you tell pretty quick who has the talent and who doesn't or do even the McGraths and Villopotos need serious instruction to make it? Yes, I have a very good eye for talent. Not only about how they ride the bike but how they are off the bike as well. What type of attitude they have most of the time is a primary ingredient. Top riders, like you mentioned, are going to be really good anyway but having the right coach to help them polish their talent is very important. These riders are young and having an older more experience rider who has already been there and done that is a huge benefit. 8. How do you think the sport has changed from your racing days to today? Of course there have been a lot of improvements. The technology, the organization and the knowledge that keeps going back into the sport keeps elevating the bar. Each generation of riders, mechanics, teams and technicians keep improving. I'd say this happens about every 10 years - the next generation is racing and all things are better and faster. For these young riders the window of opportunity doesn't stay open long and they better be committed and work hard while they can. Once the fat lady stands up and sings it's all over before you know it. 9.	Who was your biggest rival back in the day, and if the 1974 Gary Semics could race anyone today who would it be and why? I can't pick just one biggest rival. There were many at different times. I think the best answer would be myself. If I would have known how to stay focused on racing to the best of my ability and always believed in myself things would have gone much better. I think any older motocross racer would love to know how they'd stack up with today's racers. The truth is that's impossible to measure. I do believe the top riders back in the day would be right up there in the mix today. I was a very smooth, technical rider so I think I would do very well in today's world. 10. And finally, where did the 500cc class go? It turned into the 450 class. The horsepower is about the same. Motocross in the states did away with the 500 Class in 1992, I believe. I came out of retirement and borrowed a 500 Honda (I was on a 250 Yamaha at the time) and raced the Steel City PA round. I finished 20th overall. My days of getting holeshots were over as I didn't get very good starts. I think the 500 class disappeared because the 125 and 250 bikes had become very good by this time. It was too confusing for spectators and too difficult for the AMA to continue having a 3rd class. The AMA didn't need or want it anymore. Many, many things have evolved in Motocross/Supercross but one thing will never change. It will always be man and machine against the other men and machines from the starting gate to the checkered flag.